Rohde & Schwarz is pleased to have helped the University of Nottingham develop their electric Superbike which took second place in the SES TT Zero race at the Isle of Man TT this summer. The University of Nottingham achieved its highest ever placing at the event, splitting the two factory Mugen bikes, an historic feat never achieved by a university team. Rohde & Schwarz provided their handheld oscilloscope, the R&S Scope Rider, to the University of Nottingham team to develop their 2018 electric bike. The R&S Scope Rider was used in the lab, on the rolling road dyno, test track and on the track at the Isle of Man TT during practice and race weeks. The team managed to improve on their previous position of third in 2017 and shaved 1.45 minutes off last year’s lap time and improving their average lap time from 109mph to 119mph. The Isle of Man TT Zero race is an electric motorsport event which was introduced in 2010. It involves one lap (37.733 miles) of the Snaefell Mountain Course whereby the motorcycles have to be powered without the use of carbon-based fuels and have zero toxic/noxious emissions. The Nottingham electric superbike has undergone considerable modification in the last 12 months, including a new powertrain with a different converter and a modified motor. Rohde & Schwarz provided a R&S Scope Rider oscilloscope to the University of Nottingham team to be used for fault finding and communications management. The R&S Scope Rider is the first handheld oscilloscope with the functionality and touch and feel of a state-of-the-art lab oscilloscope. It is equally impressive in the lab and in the field. It has been designed with an easy to use interface, combining a tablet-like touchscreen, large buttons and a practical multifunction wheel for convenient parameter adjustment, making every function and setting easily accessible, even with gloved hands. With an acquisition rate of 50,000 waveforms per second, a 10bit A/D converter developed by Rohde & Schwarz, isolated floating channels and a maximum bandwidth of 500 MHz for the analogue input channels, it outperforms comparable bench instruments. R&S Scope Rider is based on a high-performance oscilloscope featuring a precise digital trigger system, 33 automatic measurement functions, mask test and XY diagram mode. In addition, it integrates seven further instrument functions: a logic analyzer with eight additional digital channels, a protocol analyzer with trigger and decoding capability, a data logger, spectrum and harmonics analysis, frequency counter and a digital multimeter. 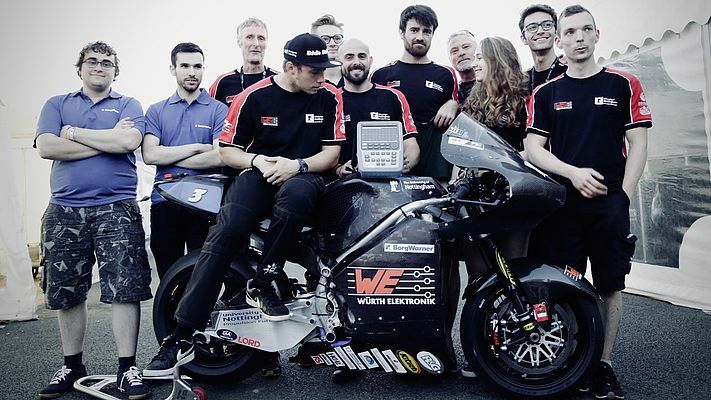 The University of Nottingham superbike has also recently won its class and category at the Pikes Peak International Challenge and made appearances at MotoE European Championships at Donnington Park and Assen TT in the Netherlands in August 2018.